However, when the volume scales-up to hundreds of milliliters or liters, the problems (high losses despite long separation times, irreversible aggregation of the beads) become evident. To avoid these unpleasant surprises it is very important to select the right biomagnetic separation conditions at the early steps of the project. 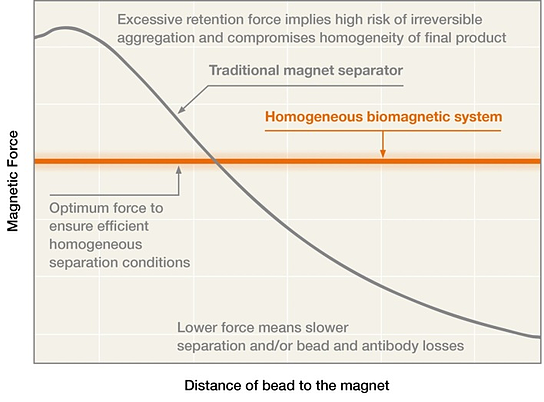 The best way to keep consistency at different volumes is to validate the process using homogenous magnetic force, i.e. having all the beads in the same biomagnetic separation. For this we need to fulfill two conditions: a constant magnetic field gradient and, simultaneously, a field big enough to saturate the magnetic beads. On this way, the process is defined by the field profile (the gradient value) and the conditions can easily be scaled-up. Note that the exact force value would depend on the bead magnetic moment, thus the optimal value of the gradient would be different for small magnetic beads or for bigger one. The force should be big enough to retain the beads when the supernatant is extracted, but gentle enough to avoid irreversible aggregation. If the force is kept constant when the process is scaled-up, the separation speed would be the same. Thus, the separation time will scale proportional to the distance travelled by the farthest magnetic bead. The only potential concern would be if increasing the time nearest beads would be retained can generate irreversible aggregation. As the retention force is gentler than in classical separators, the probability is almost zero. The effect of longer separation times can easily be experimentally assessed at small volume: extracting the supernatant can be performed not when the separation is complete, but delayed until the estimated separation time at large volume. As the magnetic beads experience the same force during the same time in both volumes, this simple experiment may reassure about the lack of irreversible aggregation problems before investing in the large volume equipment.